Jewish Community Housing for the Elderly First to Reach Multifamily Affordable Housing Energy Efficiency Goal – Ahead of Schedule. Staff fondly call it “Boston’s best kept secret” in affordable housing. But now the national spotlight has found Jewish Community Housing for the Elderly (JCHE), which this spring became the nation’s first multifamily affordable housing provider to achieve the Better Buildings Challenge (BBC) goal, achieving an impressive 24 percent energy savings in just six years. JCHE, a HUD-assisted senior living organization, made a public pledge through the BBC in 2013 to improve the energy efficiency of its building portfolio by 20 percent over the course of 10 years. Since then JCHE has achieved its goal four years ahead of schedule. The organization reached 24 percent energy savings across its portfolio of eight buildings, representing cost savings of $288,000, most notably at its campuses in Brighton and Newton, Massachusetts, totaling 926,000-square-feet. JCHE joins 13 other 2017 BBC goal achievers in other sectors, including big names like General Motors, Staples, and Macy’s. These organizations are putting themselves to the energy savings test, while showcasing and sharing the solutions they implement to spur billions in new investment and accelerate energy savings in commercial buildings, multifamily housing and industrial plants. JCHE leads the way with several projects, including its addition of solar electric and geo-thermal heating and cooling at Shillman House, a new, high-performance building of 151,020 square-feet that uses just half the energy of a typical similar building. The project used eight sources of financing, including funds from the Green Affordable Housing Program administered by the Massachusetts Housing Finance Agency for and on behalf of the Massachusetts Clean Energy Technology Center. Ulin House is a 141,000-square-foot building that includes 239 studios and one-bedroom units. Using a $42.4 million HUD 221 (d)(4) loan as part of HUD’s “Markup-to-Market” program, JCHE retrofitted Ulin House with LED lighting and Energy Star appliance upgrades, additional insulation, water-efficient toilets and faucets, new windows, state-of-the-art air conditioners, a combined heat and power cogeneration system and an energy management system. 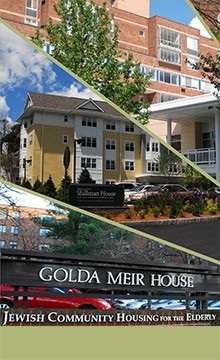 Most recently, in early 2017, JCHE began an energy- and water-efficient retrofit of Golda Meir House, a 170,000-square-foot property of 199 apartments. The project will improve indoor air quality and increase natural daylight for all residents, and is being financed with 4 percent Tax Exempt Bonds and 4 percent Low-income Housing Tax Credits (LIHTC). Although there were obstacles to implementing building improvements, JCHE was able to find the right resources to fund them. With support from HUD and DOE, JCHE’s investments are paying off through significant energy savings, freeing up funds to reinvest in the organization’s mission to provide superior housing and supportive services that allow its residents to thrive as they age in community. To learn more about the Better Buildings Challenge, visit http://betterbuildingssolutionscenter.energy.gov.